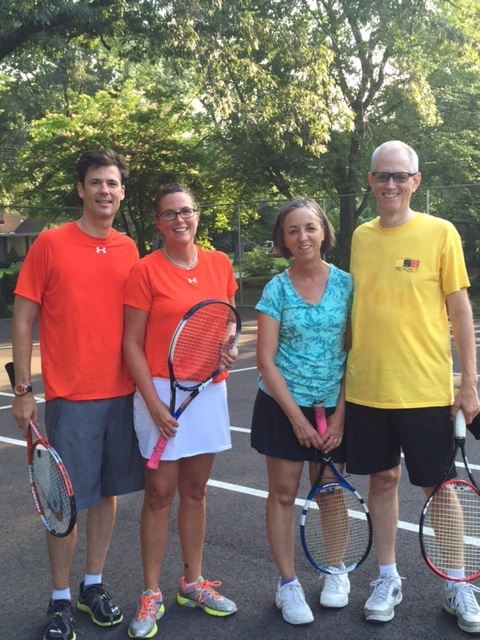 Congratulations to Jess & Brandt Butcher, who won their first round tennis match against Whitehurst! FOCA saw two wins today in tennis, with Stephanie Murphy scoring a women's singles win over Oakleigh Forest and Dave Johnson scoring a men's singles win over Whitehurst. Congrats to Stephanie and Dave! Actually there was tennis (I know the forgotten Olympic sport). Dave Johnson beat Oakleigh Forest to advance to the gold medal match Saturday in men's singles. Also, Stephanie Murphy lost a heartbreaker in women's singles (7-7) (12-10 tiebreaker). However, she will represent FOCA in the BRONZE medal match. Way to go Steph! Full tennis update tomorrow for Saturday's gold medal matches. FOCA will be represented in the GOLD medal matches for mixed doubles and men's singles.